I am so lucky to work with some amazing couples every year and I like to think that everyone of them have become my friends. I was so fortunate to photograph Charlotte and Gemma for a pre wedding shoot in the South of France whilst skiing (a little blog of that fantastic shoot), this was a great chance to get to know them both and after talking about their plans I was really looking forward to their big day. Their day soon arrived a few months later and to be fully prepared I drove up the previous day from London so I could have a good look around the venue. 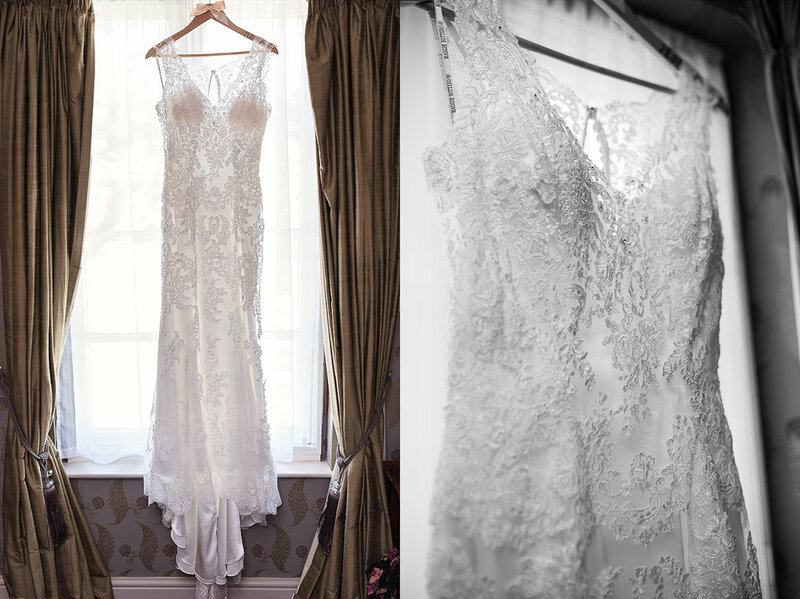 I awoke the next day to glorious sunshine and made my way to Clumber Park Hotel where both girl's were getting ready. Fortunately they were getting ready in rooms next to each other which made it really easy to jump between rooms to get images of both of them during their bridal prep. The only tricky part was making sure they didn’t see each other as I went between rooms! Both girl's were in high spirits enjoying some Prosecco with their bridesmaids and family and not a nerve in sight! The girl's had booked the talented Chloe Gray as their make artist and it was great capturing some images whilst getting their wedding day make up was being applied. Charlotte was the first to leave, being driven by her Dad in a stunning Volkswagen Beetle! This car was such a fine example! I have a particularly soft spot for these cars, my Dad owned several during the years and I always enjoyed going to the Beetle shows! Hazel Gap Barn is just a short 5 -10 minute drive away so I raced down there so I was ready for Charlotte's arrival. What a stunning venue Hazel Gap Barn is. When Charlotte and Gemma first booked me to be their wedding photographer I had a quick Google search of the venue and could see it was currently being renovated from an old barn in time for the upcoming wedding season! Over the coming months I have to admit I was regularly checking their website keen to see the progress! 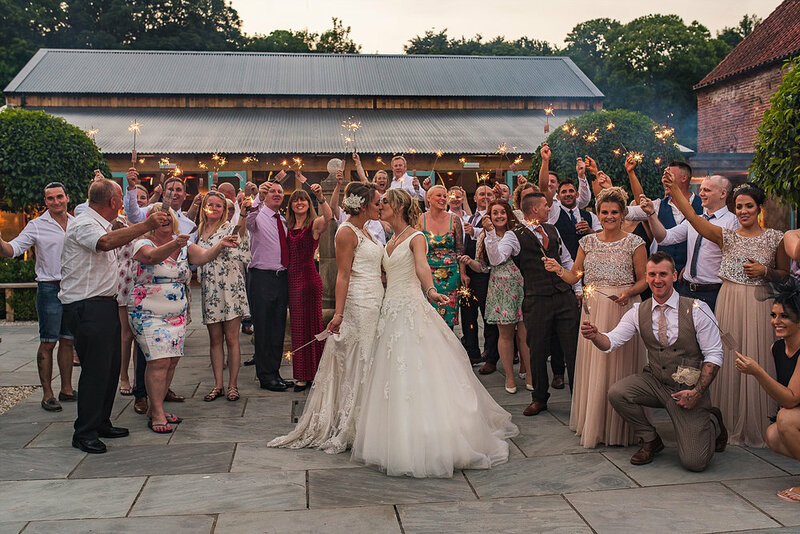 The barn is set in some beautiful countryside and is a truly beautiful venue for couples to get married! It has a wonderful romantic rustic touch and everywhere you look you can see huge attention to detail was given whilst renovating the building! Whilst waiting for Gemma to arrive I took the opportunity to get some candid photos of the girl's family and friends and of Charlotte patiently waiting for her future wife. The moment Gemma started walking down the central aisle of the barn by her Dad there were a few teary eyes around the room! A beautiful ceremony followed which was easy to capture with its wide spaces to move around. After the ceremony, the girl's walked through a bubbles aisle (a really cool quirky alternative to confetti) into the stunning courtyard for some drinks and canapes. The sun was in full force and turned out to be one of the hottest days of the year, however the refreshments were keeping everyone happy which meant it was perfect time to capture some group photos before taking the girl's away for a few photos of just the two of them. For the next 20 minutes I managed to get some wonderful photos of Charlotte and Gemma in the grounds surrounding the barn and with them both being so relaxed it was a perfect opportunity for me to get creative and try out some new photo ideas. 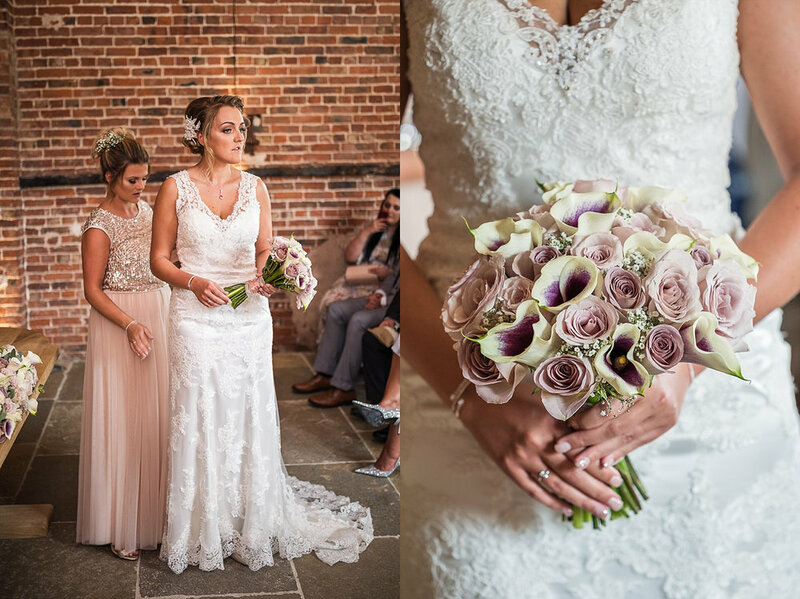 The girl's looked stunning wearing their Sassi Bride dresses and carrying their flowers prepared by Elle Flowers and with the backdrop of the barn I captured some of my favourite photos I have ever taken. Onto the reception, the guests were treated to some incredible food in the Oak Room overlooking the gardens which was followed by some wonderful heartfelt speeches from Charlotte and Gemma’s family and friends. This was also a good chance for me to capture some of the details that had been beautifully prepared by Venue decorators Pretty Little Extras. The first dance followed back in the barn where the girl's were surrounded by their guests before everyone joined in! The evening was enjoyed in the courtyard which had open fire pits which were perfect for toasting marshmallows over. As the night set in, I managed to steal the girl's away from their guests again for some dramatic night portraits in front of the barn with the setting sun behind. 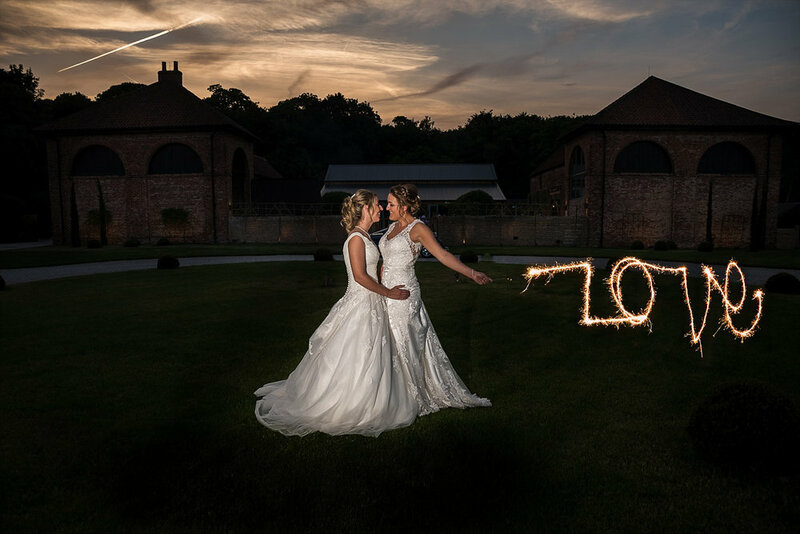 Before I left to leave the girl's and their guests to party the night away, I took the chance to capture some photos in the courtyard with the girl's surrounded by their family and friends with some sparklers which truly sealed the end of a splendid day and one I will never forget. It truly was an honour and privilege to capture Charlotte and Gemma’s special day, such an amazing couple with so much love for each other and I am proud to call them great friends! 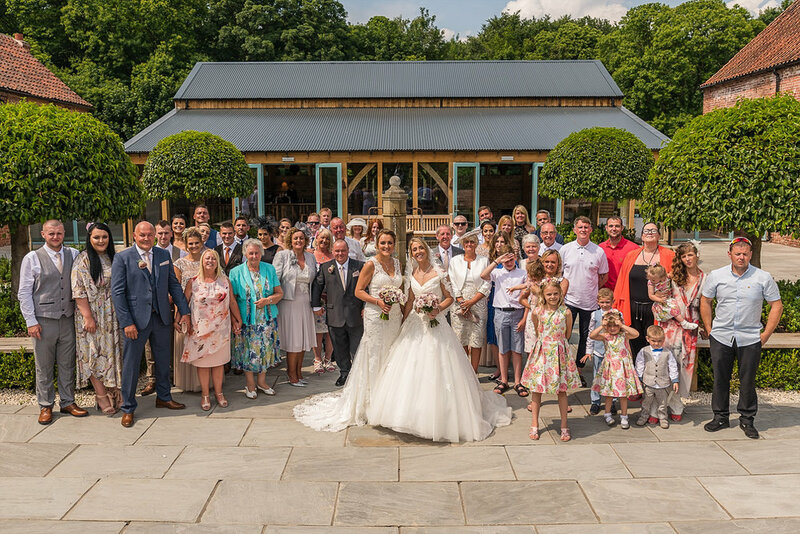 I hope you enjoyed viewing Charlotte and Gemma's Hazel Gap Barn Wedding photographs, if you are looking for an experienced professional photographer to capture your big day I would love to hear from you. Contact me today to have a chat about your wedding plans!